NOTE: Attachments from your computer create an actual copy within Trello. Attachments from Google Drive, Dropbox, Box and OneDrive simply link back to the document in its respective location. Documents that are attached with Google Drive and OneDrive can be edited and saved in their respective applications and do not need to be downloaded, saved, and reattached to your card. Click the front of the card to open it. 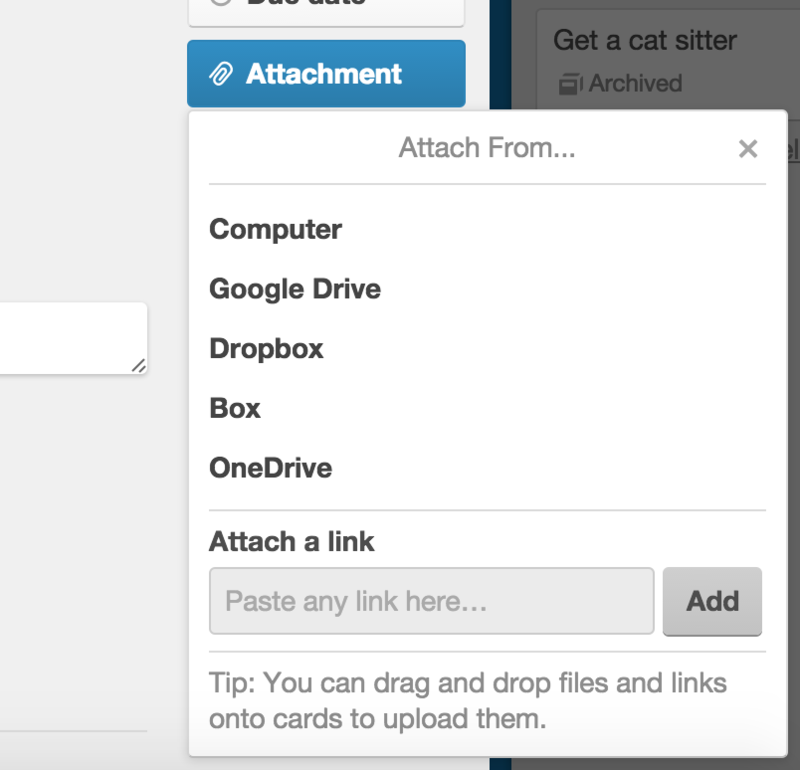 Click the "Attach File" button on the right side of the card to upload. Attach files to your cards to keep your project in one place. On newer versions of Chrome and Safari, you can simply drag and drop the file from your desktop on to the card. This doesn't require opening the card first. 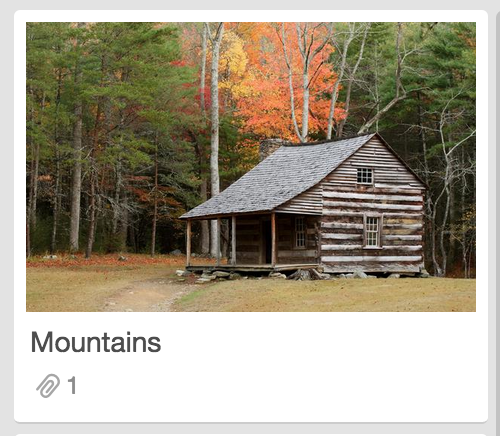 For image files which you upload to a Trello card, Trello will automatically create a picture to put on the front of the card and in the header of the card back. These are called "card covers." Card covers aren't available for image files that are linked via Google Drive, Dropbox, Box or OneDrive. As with other kinds of attachments, in Chrome and Safari, you can drag and drop the file from your desktop onto the card in order to add it. In IE, Firefox, and Chrome, images can be also be pasted directly onto cards from your clipboard. On a Mac, use the cmd + v. On a PC, use ctrl + v. You can also right-click and select "paste." This is particularly useful for sharing screenshots—you can even even hold down the ctrl key on a Mac to copy the screenshot to your clipboard directly (most PCs will copy the screenshot to your clipboard automatically). You can click a card to open it to choose which image to use as a card cover (or remove the card cover if you wish to no longer display that image on the front of your card by clicking the Remove Cover link next to the attachment). Use card covers to add some life to your board! Card covers can be disabled on a board by a board admin. To turn them off, open the board's Additional Settings in the boards Menu and uncheck "Card Cover Images Enabled". Bonus Tip: Animated gifs that are less than 300 pixels wide and less than 5MB will display as animations on card covers. You can preview your attachments within Trello without having to download them by clicking on the thumbnail of the attachment from the card back to open the preview. This allows you to quickly view documents, images, .PDFs, and almost anything you have attached to your card. You can also open the file in a new tab by clicking on the icon of the box with an arrow on it. To download the file, you can right-click on that icon and then choose to save the link. There is a 10 MB file upload limit per attachment. However, Business Class and Trello Gold members have a 250 MB file upload limit per attachment. There is no limit on the number of attachments you can have on a card or board. Neither is there an account data storage limit. The 10MB file upload only applies to files uploaded from your computer. It does not apply to files attached from Google Drive, Dropbox, Box or OneDrive. If you attach a file from your computer (using the "Computer" option in the "Attach File" menu), the attachment is stored in Amazon S3. The URLs for the attachments are cryptographically unguessable, meaning that no one is going to be able to guess your attachment URL. However, if you share the URL for a Trello attachment, anyone with the URL will be able to see the attachment. Deleting the attachment in Trello removes the file from Amazon S3. If you need extra security, we recommend using Google Drive for attachments. You can attach files from Google Drive directly to Trello and specify fine-grained access to the file via the Google Drive interface.